Oh, the mall. Dining at the friggin mall. It’s not that fun, not that fun at all. The food court? Cheesecake Factory? TGI McScratchy’s? When I was there the other weekend, it was agonizing deciding. So we ended up at Bertolini’s at the Plaza. We dined al fresco, but we were inside. Ha. Right outside the doors, they have a pretend outdoor dining area. We asked for it, and they gave. Our server was nice enough. I mean for being a waitress at a nicer italian place inside the mall that is. 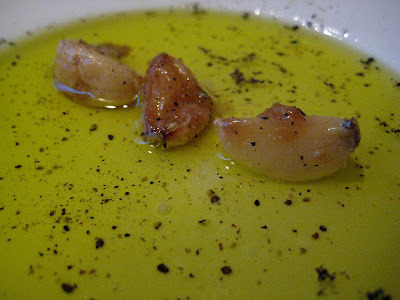 Complimentary bread with garlic infused olive oil. It was fine. 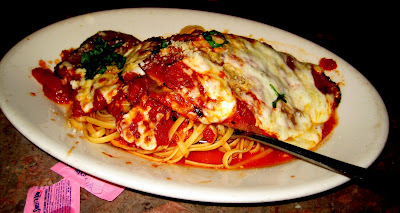 R got the eggplant parm, but it wasn’t quite eggplant parm. Isn’t eggplant parm supposed to be breaded and fried? This eggplant wasn’t breaded nor fried. It was grilled. It was still crunchy. At least the linguine and the sauce wasn’t bad. But really, it would have been better just as a plate of spaghetti. I got the lasagna. It was really really tall and thick. 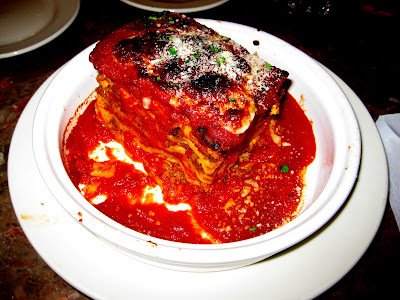 Seriously, the tallest lasagna I’ve ever encountered in my life. It was ok, but nothing I would want again. The meat tasted funny, not like funny rancid, just funny. Like it was sausage and had weird spices in it that I didn’t expect nor want in my lasagna. The first time I went to Bertolini’s was probably nearly 10 years ago. I hadn’t missed it at all. And I won’t mind if I never have to go back for another 10 years or more.